If you already successfully grow onions in your garden, you'll likely be able to get a modest crop of garlic, too. Garlic rarely produces seeds, so the garlic bulbs are planted, usually in autumn because they need a long, chilling period in the soil over the winter dormancy. Individual cloves of garlic may also be planted in early spring, as soon as soil can be worked, as early as late February or March. While the size of the garlic bulbs at harvest time will be smaller than if they had been planted the previous fall, they still provide good-sized cloves for use in your kitchen. Choose a spot in your garden that has fertile, loamy soil and receives at least eight hours of direct sunlight daily. The soil should be well-draining and crumbly when you dig up a sample area with the garden shovel. If the soil is sandy or dense clay, incorporate compost or well-rotted manure to improve its texture and water drainage. Dig the selected garlic planting area with the garden shovel to loosen the soil to a depth of 5 to 6 inches. Pulverize any large clumps of soil as you overturn the soil. This is also the time to add organic matter to help improve the soil's texture and drainage. Make sure to till that material into the soil with the shovel as well. Grade the planting area smooth with the back side of the shovel, creating an even bed free from large clumps of soil or other irregularities. Consider letting this area naturally settle for three to seven days so the soil particles settle and gently compact. A rainfall often settles the soil perfectly after you have worked the soil. Gather your garlic bulbs and hoe and return to the planting area. Break apart the bulbs into individual cloves and count the number to be planted. Don't plant cloves that are rotted, diseased or shriveled. Focus on those that are large, firm, plump and have their white skins. Create a furrow 1 inch deep with the garden hoe in the planting area. Garlic cloves are placed about 4 inches apart from each other for good spacing, so estimate the row length needed based on the number of cloves in Step 4. For example, if you have 30 cloves, that means you need a furrow 120 inches long. Feel free to make multiple rows, spaced 18 to 30 inches apart from each other. Plant the cloves upright in the furrow, with the pointed side up and the slightly wider base with remnant root scars downward. Nudge them into the soil so that the tips are 1/2 to 1 inch below the soil surface as measured once you fill the furrow. Space the cloves 4 inches apart from each other. Replace the soil into the furrow when all cloves are planted. Gently tamp the soil surface over the garlic row with your hand or the back side of the hoe blade. Apply 3/4 to 1 inch of water from a sprinkling can or garden hose with gentle sprinkling head attachment. This watering helps compact the soil, remove air pockets and coax the garlic cloves to initiate their first roots and sprouts. Garlic bulbs need a winter chill prior to spring planting. Keeping the garlic in a cool, frost-free location for two to three months before spring planting ensures they will grow well. Place them in the basement or garage in temperatures between 35 and 50 degrees F.
Once growing, garlic plants appreciate an evenly moist soil as well as lots of fertilizer. Use a mulch later or rich compost or manure or an application of 10-10-10 according to label recommendations to grow as large of garlic bulbs as possible. Harvest garlic in the autumn once the foliage naturally yellows and withers. 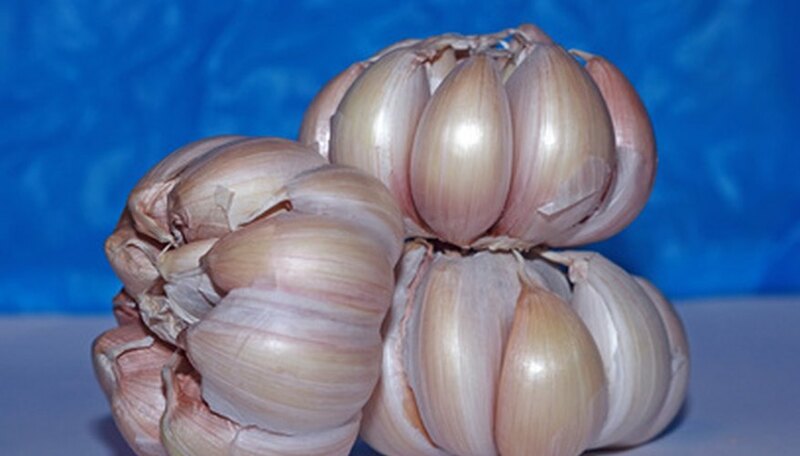 Do not divide the garlic bulbs into cloves until you are planting them in springtime since early separation results in decreased yields, according to The Ohio State University. Do not plant garlic in mid- or late spring--it's too late. There isn't enough time for the foliage to grow fully and ripen before the fall frosts. It simply means the bulbs will be small-sized when you harvest since the growing season wasn't long enough.